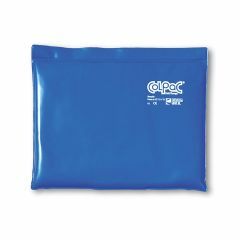 ColPaC Cold Packs - ColPaC - 11 x 14"
Allegro Medical presents the ColPaC Cold Pack. The ColPaC easily sizes and shapes to fit any body area for comfort and ease of use. Simply chill in freezer and apply. ColPac brings all the benefits of cold therapy to help relieve pain. Keep one in your freezer, for those everyday aches and pains, sports injuries and muscle pulls. ColPaC has been proven to be flexible and comfortable as they provide up to 30 minutes of healing cold therapy. Reuse them again and again. Always use layers of dry terry toweling between ColPac and skin. For Initial Chilling of the ColPac, remove from all packaging, place flat in Chilling Unit / Freezer for two hours. Do not chill below 0° F. To keep them moist, place in a plastic bag, seal, and then place in freezer. This will preserve them and prevent them from drying out or getting hard. Never Let ColPac Cold Packs Dry After Use - Always Keep Them In Freezer. Following Surgery. Great for Bakc. Great for Back. Bad back from work. Bad shoulders from work. This is an good cold pack. Keep frozen, ready to use. Biggest drawback, the seams WILL inevitably split and begin to leak the inner material. I try super gluing and duck taping the split seams and it holds for a bit. Eventually you end up taping the entire seam on all four (4) sides, but even they begin to leak. Putting these behind you say on your back must cause too much internal pleasure on the seams. Tried to contact manufacture but got nothing. They need to rethink their seam design. Seems dont hold up for me very well.. I have had to buy about 4 of these seems I dont get much use out of each one. I use it for my knee laying it on top, but some how after a few months it leaks from a seam. FAR to costly to keep buying them and having them leak white yucky stuff.. so I just started using ice bags from the drug store. Not as fast and easy but so much cheaper..
Easy To Use. Effective. Good Value. stays cold a long time. stays cold a long time. molds well to body. super quick delivery. seam break after hard use. Elderly. Daily Use. back/sciatic issues. My husband has had chronic back/sciatic pain for 30 years and uses an ice pack many times daily. No other ice pack holds the cold this long nor is more moldable to the body--it is the BEST ICE PACK AVAILABLE!! It does seem that the plastic cover has a tendency to split open quicker than the older ColPaC models did, but still is unparalleled in its effectiveness and use. Sturdy. Good Value. Easy To Use. Following Surgery. Emergency. Elderly. Daily Use. After injury. For swelling. Easy to keep cold in freezer so its always ready for use. Good Value. Easy To Use. Effective. stays cold. very efficient shipping. Elderly. Daily Use. back . sciatic pain. Elderly. Chronic pain. long term back/sciatic pa.
My puppy chewed holes in it. Is it recyclable? Can it be repaired? If not, how to dispose to avoid landfill. Yes, it is. I love using an ace bandage wrap and to hold it in place. Works perfectly. With standard shipping, how long does it usually take to receive this product?